Riptiders webcomic - Get Ready for rush hour. So today marks the completion of the first issue of Riptiders, and what a journey it was. I've worked in comics before, but this was the first time I ever pencilled, colored, and lettered a book of my own creation. There's no description of the feeling of pride and accomplishment that is swelling within me right now. In creating the Riptiders universe, I output more artwork in one year than I have in a long, long time. That isn't the side of a table, that is the amount of artwork I've produced in crafting this galaxy of unforgettable personalities. And I can't wait to create more pages and tell more stories. I've got plots leading up to the championship race and beyond. Trust me guys, this is going to be a lot of fun. That said, I'm going to take a break from updating for awhile. Although that's not entirely true, because while the site won't be seeing updates for a few weeks, I won't get a chance to take a break. Next on the agenda is spreading the word about Race Entertainment, and that includes posting on forums/websites, collaborating with other creators, starting production on the premium version of issue #1, which will be on sale shortly, and then creating the pages for issue #2! That's some break! Hopefully you fans have enjoyed reading the first issue nearly as much I enjoyed making it. 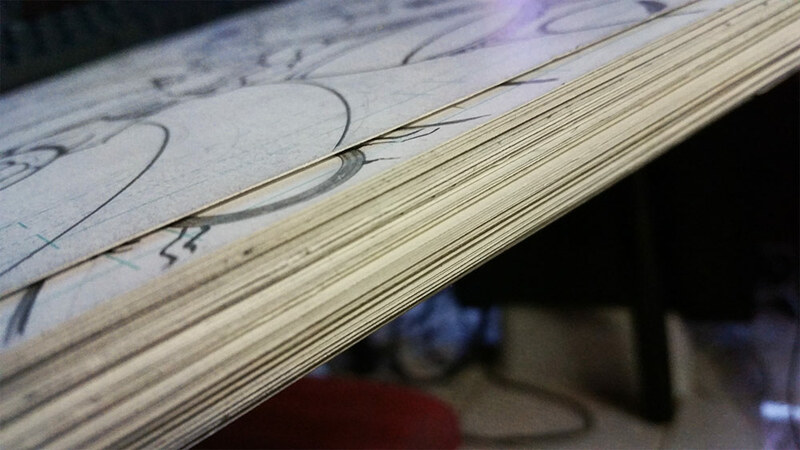 Each page is a struggle to balance wanting to put in more art, more jokes, more effects, and still hit the deadlines. One of the biggest obstacles to Riptiders is time, there simply isn't enough of it to go around. But I'll keep going as long as I can because I love this project just that much. If you really enjoy what Race Entertainment is all about, please consider supporting Riptiders via Patreon, every little bit really does make a huge difference. If you can't support with money, but still want to help, that's tremendous as well. Riptiders is still in the grass-roots stage, and can use all the promotion it can get. Spread the word via social media or word of mouth or taxi cab or just shout it from the rooftops! If a million people read Riptiders and it never made a dime, I'd be ecstatic. All I want is people to read my wacky story about fish people. If you don't want to spread the word about Riptiders because you already told all your friends and Aunt Freida, don't know how to tweet people, or just don't feel like it, that's cool too! Riptiders can still use content! Your fanart is much appreciated, as well as your questions and letters that are primed to go in the special edition of the issue. If you don't want to spend money on Riptiders, spread the word about Riptiders, or draw a picture of a fish and call him a Riptider and send it in, that's STILL cool. Just having you read the comic is good enough. I'm doing this project because I want you to get a kick out of it and just laugh. Comics should be fun, and that's what the endgoal for this project is: having the most fun you can have in the whole universe. So in conclusion, I want to thank everyone involved in the Riptiders universe: Alan Belongie for his tireless assistance in prepping the pages, Graeme Pollard for his creation and maintenance of the site, Grant and Jessica George for their voice contributions, and especially you, the reader. The person this site was created for. Thank you. Oh, and you can watch me play videogames on Friday.